It’s hard to keep up with the message on eggs. Are they good for you or not? In the 1960s, people were told: “Go to work on an egg”. But in the 1970s the public was advised to avoid eggs because they were linked to high blood cholesterol. The negative press on eggs continued in the 1980s when raw eggs were linked to salmonella poisoning. The message changed in 1999 when a study, published in JAMA, a leading medical journal, found no link between egg consumption and the risk of cardiovascular disease – except possibly in people with type 2 diabetes. This lack of a relationship between egg consumption and cardiovascular disease was reaffirmed in 2013 in an analysis of 17 reports of studies involving over 3m participants. Indeed, eggs seemed to have been rehabilitated as part of a healthy diet, so much so that it became fashionable to keep chickens. Eggs were in the news again in 2018 when a report from China on half a million people noted a lower incidence of cardiovascular disease (mainly haemorrhagic stroke) in people who regularly ate eggs, for reasons that remain uncertain but could be due their to contribution to protein intake, as suggested by previous studies in Japan, which has one of the highest intakes of eggs in the world. But now the doom merchants are back, warning that eggs can kill. This latest report, published in JAMA, followed nearly 30,000 participants for an average of 17 years. Of these 5,400 had a cardiovascular disease “event” (heart attack or stroke). The researchers found that each egg consumed was associated with a 2.2% greater absolute risk of cardiovascular disease over the follow-up period (roughly 22 extra cases of cardiovascular disease per 1,000 participants). The statistical methods used were robust, and the pooled data from six studies represents the ethnic diversity of the US population and the diets of ordinary Americans. The study’s limitations are the dependence on a single measure of dietary intake at the start of the study and the strong correlation of egg intake with obesity and unhealthy lifestyles, such as smoking, eating lots of red and processed meat, and not eating a lot of fruit and veg. Statistical adjustments were made to correct these confounding factors (things that mask true associations). However, these corrections are imperfect and invalid when the correlations with egg intake is very strong. For example, in the US eggs are often eaten with bacon, sausages or burgers, so it’s impossible to disentangle the effects on CVD risk of eggs from these fatty meat products. Also, the increased risk was much greater than would be predicted from the known effects of eggs on blood cholesterol levels. These findings need to be considered in the context of the North American dietary pattern because they may not apply to other dietary patterns, especially Asian. Observational studies such as these can only show associations (they cannot prove causation), so they should be treated with caution. Go to work on an egg, advert from 1966. The average egg consumption in most countries is usually only three or four eggs a week. A medium-sized egg provides 226mg cholesterol and average cholesterol intakes typically range between 200-250mg per day. It is easy to be confused by a high blood cholesterol level, which increases the risk of cardiovascular disease, and its relationship with dietary cholesterol, which is mainly provided by eggs. Very high blood cholesterol levels are usually inherited or caused by a lack of some hormones (such as thyroid hormone). But moderate increases in blood cholesterol are related to diet. In 1916, a Dutch physician, Cornelis De Langen, noted that the Dutch in Java, an island in Indonesia, had atherosclerosis (plaque build-up inside the arteries) and cardiovascular disease, but this was uncommon in the Javanese on their native diet, which was mainly based on plant foods with a few eggs a week. He linked high blood cholesterol to heart disease and showed that putting the Javanese on a Dutch diet increased their blood cholesterol by about one millimoles per litre (mmol/L), which is quite a large effect. Most adults in North America, Europe and Australasia have moderately increased blood cholesterol levels as a result of middle-aged spread, saturated fat intake and, to some extent, cholesterol intake. 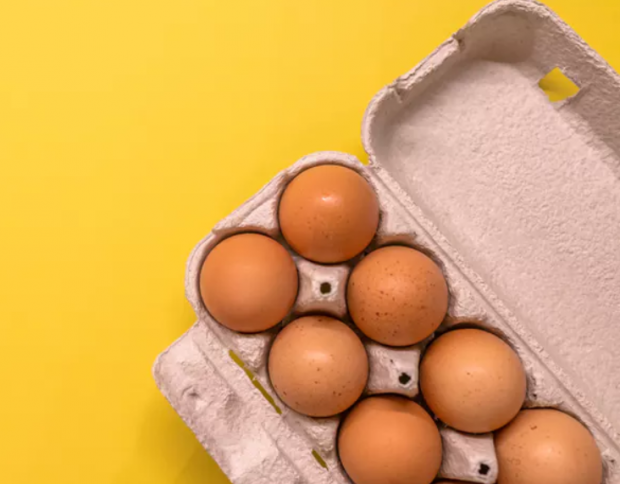 Randomised controlled trials, where participants are fed increasing amounts of eggs, have found that each 200mg of cholesterol from eggs increases the harmful form of blood cholesterol, low-density lipoprotein (LDL), by only 0.1mmol/L (about a 3% increase). But dietary cholesterol also enhances the LDL cholesterol-raising effect of saturated fat. Meat eaters who reduce their saturated fat intake can expect to lower their LDL cholesterol by 0.3mmol/L. But LDL cholesterol is typically 2.4mmol/L in vegans, who consume no cholesterol and have low intakes of saturated acids, compared with meat eaters where the average is 3.5mmol/L. Between a quarter and a third of the population inherit a version (an “allele”, in the jargon) of the APOE gene called e4 that makes them much more sensitive to dietary cholesterol than those who carry the more common e3 allele. They can show a 10% increase in LDL cholesterol with dietary cholesterol from eggs. There is also variability on how much cholesterol is absorbed. Most of the cholesterol in the small intestine is derived from bile secreted from the liver rather from eggs. Plant sterols, which are added to some foods, such as yogurt drinks and margarine, block cholesterol absorption and lower LDL cholesterol by up to 10%. So even people who carry the e4 allele can eat eggs without increasing their LDL cholesterol if they consume plant sterols in the same meal. The American diet contains large amounts of meat and eggs, and it seems probable that a high intake of cholesterol (about 600mg per day, equal to two to three eggs a day) adds to the risk of cardiovascular disease, particularly in people with type 2 diabetes. There is also good reason to caution younger people about the risks of following the fad of high-protein diets that may include eating several eggs a day. Otherwise, eating eggs in moderation (three to four eggs a week) makes a useful contribution to nutrient intake and is harmless.